We study the development of infants in their first year of life. We are based at the Trinity College Institute of Neuroscience at Trinity College Dublin, and collaborate with maternity hospitals in Dublin and other centres across Ireland. Our expertise and backgrounds range from physics to psychology and neonatology to neuroscience. We use many methods to study infant development, including online tasks and MRI. Màiri has a broad education in science, research and education from Edinburgh University, University College of Cork, and Oxford University, followed by a number of years of teaching experience of the International Baccalaureate at the United World College of the Adriatic in Italy. She has returned to Ireland and is currently working for two research groups in Trinity College Dublin: the FOUNDCOG Project at the Cusack Lab in the TCIN and the Thermodynamics and Energetics of Quantum Systems Group in the School of Physics. ​Lorijn completed a bachelor’s degree in language and cognition and a master’s degree in cognitive neuroscience before starting her PhD project at the Donders Institute for Brain, Cognition, and Behaviour in Nijmegen, the Netherlands. In her PhD project, she investigated how a sense of agency develops in early infancy. She used theories and methods from (developmental) cognitive psychology, neuroscience, artificial intelligence and philosophy of mind to answer how one could study subjective experiences in preverbal infants and how the capacities underlying the sense of agency emerge in the first months of life. Studied developmental psychology at the University of Trento (Italy). My research focused on the mechanisms underlying the emergence of cognition and social behaviors. Specifically, I investigated the contribution of both individual’s predispositions and external environmental factors in shaping individuals’ behavioral and physiological responses in infancy and adulthood. Chiara received her bachelor’s in cognitive science and master’s in neuroscience from the University of Padua, Italy, and then became a qualified psychologist with the aim to bridge neuroscience and developmental psychology. She is interested in how higher cognitive functions develop and how early experience can shape the way we look at the world. 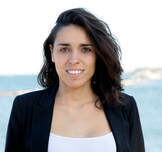 Chiara is also the president of the Dublin University Neuroscience Society, the social coordinator of the OHBM Student/Postdoc Special Interest Group, and an associate editor at the Journal of European Psychology Students. Studied mathematics and computer science at the Lomonosov Moscow State University, Russia. Laura is interested in the development of the ventral visual stream, particularly how early visual experience and innate factors interact to shape brain development, both on a region and network level. Additionally, Laura uses computational methods from machine learning to investigate brain maturity. She hopes that the methods she's working with will lead to earlier identification of perinatal brain injury, mental health disorders, and other brain diseases. Anna is in her 4th year of Psychology at Trinity College Dublin. She is doing her final year project with the Cusack Lab on the development of visual selectivity in infancy. Anna is interested in developmental research and hopes to further her experience in this field after finishing her degree. ​Clíona is in her final year of Neuroscience at Trinity. For her research project, she is investigating whether representations from deep neural networks will reveal to be better control stimuli for neuroimaging experiments that investigate the intermediate levels of the ventral stream. She is keenly interested in this exciting crossover between machine learning and neuroscience, and hopes to learn more about it in her pursuits after graduation. I am in my 4th year of Psychology at Trinity College Dublin. I am doing my final year project with the Cusack Lab on the development of visual selectivity, comparing differences between adults and infants. I intend to concentrate my future work on the effects of technology on human behaviour and brain. I would especially like to focus on the investigation of the functional brain organization that supports human cognition and consciousness. I would aspire to use methods and theories from cognitive psychology, neuroscience, and artificial intelligence.